Be the first to share your favorite memory, photo or story of Douglas "Doug". This memorial page is dedicated for family, friends and future generations to celebrate the life of their loved one. Douglas “Doug” Andrew Baldwin, age 73 of Douglasville, Georgia, passed away on Sunday, March 31, 2019. He was born in Newland, NC on January 9, 1946, son of the late Clarence Baldwin and the late Maude Bentley Baldwin. Doug was a Veteran of the United States Army during the Vietnam Conflict and worked in Civil Service for the government. He was a member of First Baptist Church in Cordele, Georgia. 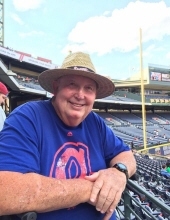 He was an avid golfer and fan of the Atlanta Braves. He is survived by his wife of 48 years, Dwanna Hathcox Baldwin; daughters, Michelle Baldwin and Amanda Baldwin,; brother, Robert Baldwin; two special nieces, Debbie Baldwin Trivett and Renea Baldwin Bolick; and other nieces and nephews; and his special family pet, Maizy. In addition to his parents, he was preceded in death by his sister, Faye Fifield and brother, Clarence Baldwin, Jr. Per his wishes, he was cremated and a graveside service will be held on Saturday April 27, 2019 at 3:00 PM at Fork Mountain Cemetery in Newland, North Carolina. The family will receive friends in Cordele, Georgia on Sunday, April 14, from 2:00 PM until 3:30 PM at First Baptist Church of Cordele. In lieu of flowers, the family suggests that donations may be made to the American Cancer Society, Hospice Foundation of America, or the Wounded Warrior Project. To send flowers or a remembrance gift to the family of Douglas "Doug" Andrew Baldwin, please visit our Tribute Store. Guaranteed delivery before Douglas "Doug"'s graveside begins. "Email Address" would like to share the life celebration of Douglas "Doug" Andrew Baldwin. Click on the "link" to go to share a favorite memory or leave a condolence message for the family.